The market for smartphones is currently five times bigger than the market for cameras; so isn't it about time that the latter learnt some tricks from the former? Samsung thinks so and has debuted the Samsung Galaxy Camera (also known by its less whimiscal product number - the Samsung EK-GC100), which it has christened a whole new category of device: predictably enough, the 'smart camera'. On paper this looks like an intelligent move: Samsung is hugely successful in the smartphone and tablet markets. And an 'always connected' camera, which can talk to other devices in its product portfolio via Wi-Fi – as well as directly access the Internet and download 'apps' – can only strengthen its maker's grip on our purse strings. Via Samsung, we now have in tech terms what marketers like to call a 'complete solution'. The only potential fly in the ointment is that Nikon – despite its image of traditionalism rather than innovation – was first to market with an Internet-enabled camera with its own bunch of apps in the Nikon Coolpix S800c. Whereas Nikon based its snapshot camera around the older Android 'Gingerbread' operating system, however, Samsung's later release date has enabled the Galaxy Camera to be bang up to date by incorporating Android 4.1 Jelly Bean. There's also a Quad Core processor on board the Samsung; claimed to be the same as that in the Samsung Galaxy S3 phone. Photographers will be pleased to know it also fields a 16-megapixel resolution from a 1/2.3-ich BSI CMOS sensor (spec shared with the Nikon) plus a 21x optical zoom. On the Samsung this provides a focal range the equivalent of an ultra wide 23-483mm on a 35mm film camera, which is useful indeed. Though the Galaxy is much physically larger than the pocket 'travel zoom' snapshot that sort of specification would usually suggest, or indeed an interchangeable lens system camera such as the Samsung NX1000, here the lens cannot be swapped however. But then it can't on the more practically compact S800c from Nikon either, which 'only' offers a 10x optical zoom. Price wise there's not a massive amount of difference between the Android cameras of the two manufacturers: The Galaxy is a suggested £399.99 while the S800c is £379.99. The fact that the operating system has been ported over from the world of smartphones means that the initial set up guides, as we also found on Nikon's S800c, refer to 'your phone' rather than your camera. Oops. And, though we found the Samsung slightly easier and faster than its Android rival to get up and running - it quickly located our Wi-Fi network from a floor below, while its Nikon rival took a few attempts even when sat right in front of it - you can't just turn it on and start shooting as soon as the battery is charged, as with a standard compact. It has to 'boot up' first. But, once it has done this, and subsequently gone to sleep to preserve power between shots, a press of the power button will throw you straight back into camera mode without a pre-amble through various welcome screens. 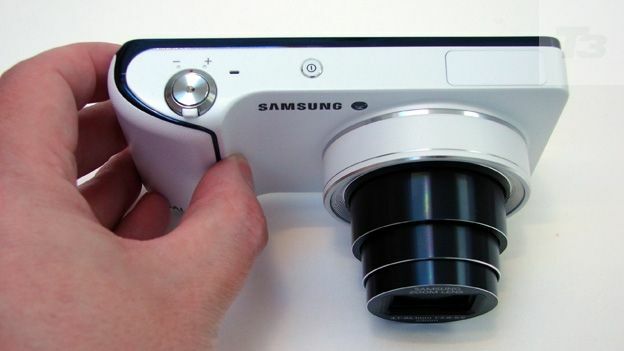 Though from the front the Samsung Galaxy Camera looks rather minimal and in many respects resembles the reverse of a smartphone or tablet with a zoom lens and handgrip stuck on – which means it lacks the more traditionalist camera elegance of the Nikon S800c – it's all about the reverse of the device here. Swallowing up the entire backplate is a 4.8-inch touch-sensitive screen – the largest of its type found on any consumer digital camera. And, apart from a shutter release button, zoom lever and power button on the top plate, this is where all the 'controls' – including a selection of pre-loaded 'apps' like Instagram - lie. The camera itself is even presented as an app in this mode, so users can easily navigate back to it with a finger prod (no stylus is provided). There are three basic shooting modes for the stills camera side of the operation: the self explanatory Auto, plus Smart mode and Expert mode. Smart is where the user has access to 15 pre-optimised scene modes. Expert mode is where users can alter exposure incrementally (up to +/- 2EV), plus tweak shutter speed, size of aperture and additionally light sensitivity, which here runs from a standard ISO100 to ISO3200 – or all three in succession if you've selected the fully-comprehensive Manual option. The other shooting mode is naturally video, and here we get the chance to shoot Full HD 1920x1080 pixels clips at 30 frames per second, and thankfully have access to full use of the 21x optical zoom. If you adjust the zoom in the midst of recording there's a wait of a second or so while focus re-adjusts and the image snaps from a blur back into sharp focus. Touch-sensitive stop and pause buttons are provided on screen, but we were slightly surprised that the camera automatically starts filming as soon as video mode is selected. We expected a bit more personal control, via a virtual red record button on screen perhaps, as is more usually the case on rivals. By touching the screen there is the further ability to fire the shutter when back in stills mode; again this is something we've increasingly seen on various touch screen cameras, including those in the Olympus Pen range and Panasonic G series. When you've taken the shot there are 35 photo editing tools accessible via the on-board Photo Wizard. A toolbar is displayed on screen and here the large LCD really comes into its own. The default setting for the camera to shoot in is 16:9 – whereby the image fills the screen – but if you want full 16 megapixel resolution then opt for 4:3 aspect ratio, which adds black borders on-screen to the left and right. Via the pre-loaded S-voice app there is also the ability to command the camera to do certain things, such as 'turn the camera on', which is neat; however we found it more practical and faster to simply user our fingers rather than vocal chords. From the moment you power up, the quality of the Galaxy Camera's 4.8-inch LCD (as opposed to the impressive but smaller OLED screen of the Nikon S800c) hits home. It's very impressive; not just due to the much larger than average size and widescreen ratio, when compared to any other digital camera on the market, but also thanks to the crystal clear image relayed via a high 1280x720 (921,600 dot) resolution. The screen is as responsive to each finger prod or swipe as we'd have hoped for, meaning that operation is both seamless and intuitive. The viewing experience is basically like that of a miniature tablet – or the brand's own Samsung Galaxy Note 2 – and here it certainly feels like one has been welded on the back of a point and shoot camera. The Samsung's battery is charged within the camera and a matching and rather fetching white USB lead and adapter plug were provided with our identically coloured unit. A cell roughly the dimensions of an After Eight mint slots into the compartment at the base shared with a slot for removable microSD card, as adopted by most phones, though to utter a moderate grumble it is more fiddly to retrieve than regular sized SD media. The Galaxy can also take a micro SIM card, while a micro HDMI port (cable optional) sits in between the two. Battery life is good for up to 290 shots from a full charge. Contrast this with the Nikon S800c which offers a meagre 140 shots from a full charge of its own power source and the Samsung Galaxy Camera is beginning to take the lead. The picture quality delivered by the Galaxy Camera is as bright, crisp and colourful as we'd have hoped for in a variety of general shooting conditions – both indoors and out – and those looking for a souped-up snapshot, or a travel zoom camera with plentiful 'extras' – won't be disappointed. Some things could inevitably be better. There are familiar image bugbears such as pixel fringing in high contrast shooting scenarios. Plus a 10cm closest focus distance is modest by the standards of rivals (which by contrast can get as close as 1cm), though in fairness on the Samsung it proved sufficient for most subjects, including close ups of flowers and still life during our test period. As we noted earlier, the zoom can be adjusted in the midst of recording a sequence of video, and though the auto focus isn't as lighting fast to catch up as we might have liked – there's a wait of a second or two – at least catch up it does. Again colourful and clean imagery is possible. The fact that the 16 megapixel, 21x zoom Samsung Galaxy Camera is one of only two snapshots currently to offer the triple whammy of being wireless, Android powered and Internet enabled, should make it compelling for gadget fans as much as camera enthusiasts. We understand the minimalist matt white version is the one that is being pushed in the UK – and was what we had to play with – though we have also witnessed striking wine red, orange, and 'cobalt black' alternatives at foreign trade shows. In terms of portability, though the camera feels large in the hand at first, it will actually slip fairly comfortably into a jacket pocket, as with a larger smartphone. Just the curved grip and lens barrel, mostly retracted when not in use, mark it out as something else entirely. That said, anyone after a svelte pocket snapper who is otherwise quite happy to keep using their smartphone for apps and Internet browsing on the move, may want to look elsewhere. This is a first generation product however and the gut instinct is that we will see physically smaller cameras with slightly better/larger sensors and interchangeable lenses – that can still connect directly to Dropbox (with 50GB of storage offered for two years) and the ilk for uploading pictures – before too long. You'd be an idiot to bet against the fact that Samsung is working on such a device right now. For the moment though the Galaxy Camera is a more pleasurable experience to use than Nikon's fractionally cheaper S800c and arguably more versatile; but whether you might be better off keeping your existing snapshot and spending what's being asked here on an actual tablet instead is entirely a choice for you. However, in the future, and undoubtedly very soon, all cameras will be made this way. The Sony NEX-7 compact system camera takes some beating, but is it worth the price?